The capacity to class switch the IgH chain is critical to the effectiveness of humoral immune responses. We show that in vitro-stimulated splenic B cells from senescent mice are deficient in production of multiple class switch isotypes (IgG1, G2a, G3, and E), class switch recombination (CSR), and induction of the E2A-encoded transcription factor E47. E47 has previously been shown to be required for CSR, at least in part via expression of the activation-induced cytidine deaminase. Our studies show that impaired induction of E47, and subsequently activation-induced cytidine deaminase, contribute to poor CSR and production of secondary isotypes in senescence. Humoral immune responses are dramatically impaired in aging mice and humans (1, 2, 3). The Abs generated in old mice are less protective compared with the Abs generated in young mice (4). Age-associated alterations in B cell repertoire expression have also been reported, with old mice showing a shift in Ab repertoire from nonself to self-recognition and from high to low affinities (5, 6, 7, 8). The ability to switch the Ig class (or isotype) is very important for the quality of an immune response. Patients who cannot switch their Ig class have been described. These include those with hyperIgM, due to a genetic defect in CD40 ligand on T cells required to trigger CD40+ B cells. Others involve loss in the activation-induced cytidine deaminase (AID),3 critical for class switch recombination (CSR) and somatic hypermutation (SHM). These patients present with upper and lower respiratory tract infection, otitis, diarrhea, oral ulcers, and autoimmunity and fail to respond to vaccination (9, 10). Both local and systemic humoral immune responses are down-regulated in old mice (11). Also in humans Ab responses have been reported to be significantly lower in the elderly as compared with adults (12). Furthermore, young mice had mostly IgG1 plasma cells producing high affinity Ab after immunization, whereas aged mice had predominantly IgM plasma cells (13), which confirmed and extended previous results (14). These studies suggested a deficit in producing secondary isotypes in senescent mice, but did not discriminate between defects in T and/or B cells nor reveal the cellular or molecular causes. Therefore, we have assessed isotype switching in senescent mice in purified B lymphocytes and determined the molecular bases of the defect seen in senescent mice. Upon activation with Ags or mitogens, B cells undergo CSR, a DNA recombination process occurring between switch regions that are 1–10 kb stretches of repetitive sequences located 5′ of each H chain constant region gene, except δ. As a result, the same B cell can express different H chain constant region sequences, or isotypes, while maintaining expression of the same H chain variable region sequences. In vivo, class switch requires T cell help. In vitro, CSR can be induced by stimulating B cells with appropriate combinations of mitogens or Abs to the B cell receptor or to a costimulatory receptor (CD40) plus cytokines. For example, Abs to CD40, or CD40 ligand itself, synergize with IL-4 to induce CSR to IgG1 and IgE, IgG1 production being more abundant than IgE production. At the molecular level, it has been recently shown that AID is required during CSR (15, 16). Importantly, it has been demonstrated that the expression of AID is regulated by E proteins because a highly conserved intronic regulatory element in AICDA, the gene encoding AID, binds E proteins both in vitro and in vivo (17). The E proteins bind to an E-box site, found in the promoter and enhancer regions of many B lineage-specific genes, including the enhancers in the Ig loci and the promoters of mb-1, λ5, and recombination-activating gene 1 (18). E12 and E47 are responsible for initiating Ig rearrangements, and for regulating the expression of the surrogate L chain (λ5, VpreB), which promotes cell survival of early pre-B cells (19, 20, 21, 22). In B lymphocytes, the active DNA-binding complex consists of E47 homodimers (23). The formation and the function of the homodimer or heterodimer depend on the balance between the E2A-encoded proteins, other class I basic helix-loop-helix (bHLH) proteins (HeLa E-box binding (HEB) protein and E2-2) and the E protein inhibitory proteins, Id1-3, which lack the DNA-binding domain and function as dominant negative inhibitors of E proteins (24). Results in this study show that splenic B cells from senescent mice, in contrast to young adult mice, undergo significantly limited CSR to multiple secondary isotypes (IgG1, G2a, G3, and E) upon appropriate stimulation in vitro with anti-CD40/IL-4 or mitogens. This occurred concomitant with decreased induction of E47 and AID. These results together suggest that the age-related decrease in E2A-encoded transcription factors, leading to poor AID expression, may account for down-regulation of CSR in senescence (3, 5). Young (2–4 mo of age) and old (24–27 mo of age) male and female BALB/c mice were purchased from the National Institutes of Aging (Bethesda, MD). Male and female young and old C57BL/6 mice, with E2A+/− on the C57BL/6 background, were also used in these studies; the E2A+/− mice, originally produced by Zhuang et al. (25), were obtained from M. O’Riordan and R. Grosschedl (26) (University of California, San Francisco, CA), and heterozygotes bred and typed according to instructions. Most of the experiments have been done with females. A few experiments have been done with males. No significant differences between females and males were seen for EMSA, Western blot, flow cytometry, ELISA, and RT-PCR. B cells were isolated from the spleens of young and old mice. Briefly, cells were washed twice with medium (RPMI 1640; Life Technologies, Grand Island, NY) and incubated (108 cells/ml) for 20 min at 4°C with 100 μl of anti-B220 Microbeads (Miltenyi Biotech, Bergisch Gladbach, Germany), according to the MiniMacs protocol (Miltenyi). Cells were then purified using magnetic columns. At the end of the purification procedure, cells were found to be almost exclusively (95–98%) B220-positive by cytofluorimetric analysis. After the isolation procedure was ended, cells were maintained in serum-free medium for 3 h at 4°C to minimize potential effects of anti-B220 Abs on B cell activation. B cells were cultured in complete medium (RPMI 1640, supplemented with 10% FCS, 10 μg/ml gentamicin, 2 × 10−5 M 2-ME, and 2 mM l-glutamine). Cells (2 × 105 in 200 μl of complete medium) were stimulated in flat-bottom 96-well culture plates with purified anti-mouse CD40 Abs (553721; BD PharMingen, San Diego, CA), alone or together with recombinant mouse IL-4 (PMC0046; BioSource International, Camarillo, CA), for 24, 48, and 72 h. In the last 4 h of incubation, cultures were pulsed with 1 μCi of tritiated thymidine. Optimal culture conditions were determined in preliminary experiments. Briefly, B cells were enriched from the spleens of young and old mice and cultured either in the absence or in the presence of anti-CD40 (0.625, 1.25, and 2.5 μg/ml), alone or together with IL-4, for 24, 48, and 72 h. Results indicate that optimal B cell proliferation is induced when 2 × 105 cells in 200 μl are activated for 48 h with anti-CD40 (2.5 μg/ml) and IL-4 (1 μg/ml). The optimal dose of IL-4 was identified in preliminary experiments in which splenic B cells from young and old mice were activated with anti-CD40 (2.5 μg/ml) alone or together with different doses of IL-4 (0.1–1000 ng/ml). Results showed that in young mice IL-4 was effective at the dose of 10 ng/ml and it attained the maximum effect at the doses of 100 and 1000 ng/ml. In old mice, conversely, IL-4 was ineffective at the dose of 10 ng/ml, only slightly effective at 100 ng/ml and significantly effective at 1000 ng/ml. Therefore, 1000 ng/ml was used in additional experiments although this dose will necessarily reduce the difference seen between young and old activated B cells. For CSR experiments, B cells (1 × 106/ml) were stimulated in 24-well culture plates (2 ml/well), for 2–14 days, with 2.5 μg/ml of anti-CD40 together with 1 μg/ml of IL-4 (for IgE and IgG1 production) or with 100 ng/ml of recombinant mouse IFN-γ (PMC4034; BioSource International), for IgG2a production). For IgG3 production, B cells were stimulated with 10 μg/ml of LPS (Sigma-Aldrich, St. Louis, MO). For the preparation of nuclear extracts, B cells (1 × 106/ml) were stimulated for 48 h in 6-well culture plates (10 ml/well) with anti-CD40 (2.5 μg/ml), alone or together with IL-4 (1 μg/ml). These conditions were found to be optimal for cell proliferation and gave comparable results in 24-well culture with respect to proliferation and class switch. After this time, cells were lysed and extracts were prepared. IgG1, IgE, IgG2a, and IgG3 were titrated in the collected supernatants by ELISA, according to a sandwich protocol. Briefly, wells of microtiter plates (12-565-136; Nunc Naperville, IN) were coated (overnight, 4°C) with 100 μl of a purified anti-mouse capture Ab (553440 for IgG1, 553413 for IgE, 553387 for IgG2a, or 553404 for IgG3; BD PharMingen) at a concentration of 2 μg/ml in 1× PBS. Reactions were blocked by adding 200 μl of 1× PBS containing 10% FCS (blocking buffer) to each well for 30 min at room temperature. Wells were then washed thoroughly with 1× PBS containing 0.05% Tween 20 (washing buffer). Serial dilutions of the culture supernatants or of the mouse IgG1, IgE, IgG2a, or IgG3 standard (557273, 557079, 555571, or 553486, respectively; BD PharMingen), at a concentration of 0.5 μg/ml in blocking buffer, were added to each well (100 μl/well) and incubated overnight at 4°C. Wells were washed thoroughly with washing buffer before receiving (100 μl/well) the detecting Ab (BD PharMingen; biotin-conjugated 553441 for IgG1, 553419 for IgE, 553388 for IgG2a, or 550334 for IgG3) at a concentration of 2 μg/ml of blocking buffer. After 1 h incubation at room temperature, washed wells received 100 μl of avidin-HRP (554058; BD PharMingen) in blocking buffer and were incubated for 30 min at room temperature. Washed wells then received 100 μl of the substrate solution, consisting of 1 volume of peroxidase substrate plus 1 volume of 30% solution of H2O2. Peroxidase substrate was prepared diluting 1.5 mg ABTS (A-1888; Sigma-Aldrich) in 5 ml of a 0.1 M citric acid solution. Wells were incubated 15–20 min at room temperature to allow reactions to develop. Well contents were measured for absorbance at 405 nm. 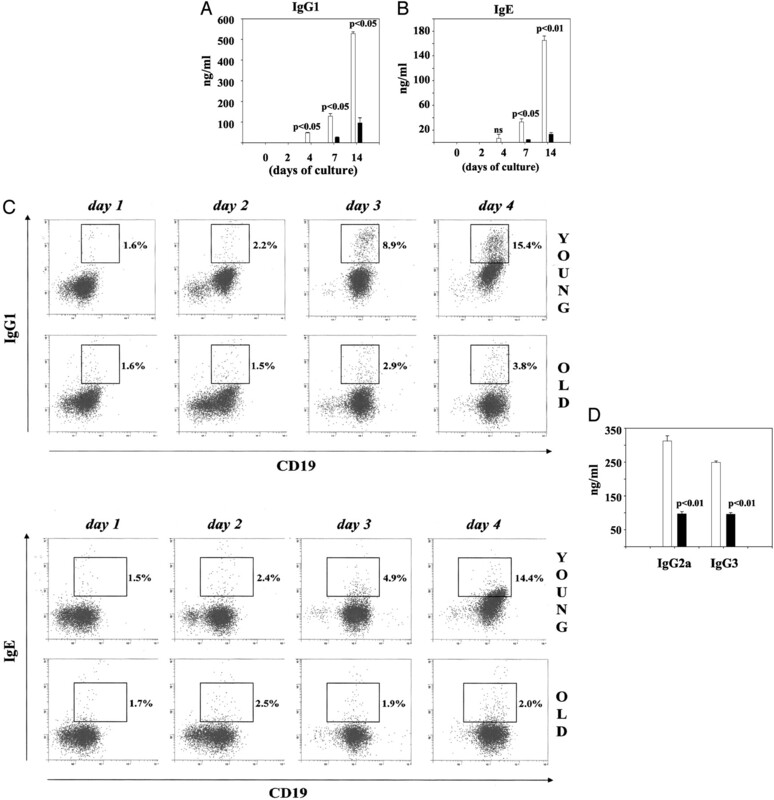 B cells (3 × 105/tube) were treated with 2 μl anti-CD16/CD32 Abs (553141; BD PharMingen), which block the non-Ag-specific binding of Ig to the FcγRII and FcγRIII, and with 2 μl anti-CD23 Abs (553136; BD PharMingen), which block the non-Ag-specific binding of Ig to the FcεRII, for 20 min on ice. For membrane IgG1 or IgE staining, cells were incubated with 20 μl biotin-conjugated rat anti-mouse IgG1 mAbs (1/40 diluted, clone A85-1, 553443; BD PharMingen) or 20 μl biotin-conjugated rat anti-mouse IgE mAbs (1/40 diluted, clone R35-72, 553414; BD PharMingen), for 30 min on ice, according to Snapper et al. (27). After washings, biotin-conjugated Abs were revealed using 20 μl PE-conjugated streptavidin (1/60 diluted, 13025D; BD PharMingen), for additional 30 min on ice. Samples of 3 × 105 cells were analyzed immediately on a LSR flow cytometer (BD Biosciences, San Jose, CA) using logarithmic amplification. For three-color analysis, controls were included in every experiment to determine background fluorescence. Before protein extraction, splenic B cells were counted using trypan blue. Nuclear extracts were prepared from the same numbers of cultured spleen cells essentially as previously published (28); briefly, cells were harvested and centrifuged in a 5415C Eppendorf microfuge (2000 rpm, 5 min). The pellet was resuspended in 30 μl of solution A containing HEPES 10 mM, pH 7.9, KCl 10 mM, EDTA 1.0 mM, DTT 1 mM, MgCl2 1.5 mM, PMSF 1 mM, 1 tablet of protease inhibitor mixture (Boehringer Mannheim, Mannheim, Germany), and Nonidet P-40 (0.1%), briefly vortexed and centrifuged (8000 rpm, 5 min, 4°C). The supernatant containing the cytoplasmic extract was removed and the pellet containing the nuclei was resuspended in solution B containing HEPES 20 mM, pH 7.9, EDTA 0.1 mM, DTT 1 mM, MgCl2 1.5 mM, PMSF 2 mM, 1 tablet of protease inhibitor mixture, and glycerol 10%). The lysate was incubated on ice for 20 min, protein sonicated for a few seconds and centrifuged (14,000 rpm, 15 min, 4°C). Aliquots of the nuclear extract were stored at −80°C. Protein content was determined by Bradford assay. The micrograms of proteins extracted from the nucleus of the same numbers of B cells are highly reproducible (90%) from one experiment to another in both young and old. The μE5 probe was prepared using 100 μl of each single strand (26 bp), at the concentration of 100 ng/μl, which were annealed v/v at the following temperatures: 85°C (2 min), 65°C (15 min), 37°C (15 min), 25°C (15 min) and on ice (15 min) and then end-labeled for 40 min at 37°C, using T4 DNA polynucleotide kinase in the presence of 1 μl of [γ-32P]ATP. The probe was then purified over a G-25-50 Sepharose column. The ku probe was prepared as follows: a double strand ku DNA fragment (56 bp), 10 pmol, was end-labeled for 30 min at 37°C with T4 DNA polynucleotide kinase in the presence of 2 μl of [γ-32P]ATP, then incubated with 20 pmol of the complementary oligonucleotide at 85°C for 5 min and subsequently cooled at room temperature. The probe was then purified over a G-50-80 Sepharose spin column. The sequences of the probes were: 5′-CCC GGC GCG GGG GCG ATT TCG AGT CA-3′ (μE5, present in the IgH intronic enhancer) (29) and 5′-GAT CAG TGA TGG AGT TGG CCA CTC CCT CTC TGC GCG CTC GCT CGC TCA CTG AGG CC-3′ (ku). The 56 oligomer sequence was constructed by modifying the sequence originally described (30) to obtain optimal ku binding to DNA, as heterodimer ku 70/80 (31). A gel mobility shift assay to determine DNA binding of E47 was performed as follows. The radiolabeled DNA probe was incubated with 10 μg of nuclear extract in the presence of poly(dIdC) as unspecific competitor for μE5. The reaction was performed at room temperature in 15 μl of binding buffer (Tris-HCl 10 mM, pH 7.5, EDTA 0.5 M, NaCl 150 mM, DTT 1 mM, PMSF 1 mM, glycerol 10%). To inhibit the DNA binding of E47, the nuclear extracts were preincubated with rabbit anti-mouse polyclonal E47 Abs (2 μg, sc-763; Santa Cruz Biotechnology, Santa Cruz, CA), before the addition of the radiolabeled probe. These Abs were the best supershifting Abs, as compared with other anti-E47 Abs tested (23). Other Abs used in EMSA experiments were: rabbit anti-mouse polyclonal E12 (sc-762; Santa Cruz Biotechnology), polyclonal anti-E2-2 (sc-8589), rabbit anti-mouse polyclonal HEB (sc-357; Santa Cruz Biotechnology), rabbit polyclonal anti-ku 80 Abs (AHP 317; Serotec, Oxford, U.K.). The samples were electrophoresed in a 6% polyacrylamide gel at 275 V for 3 h at room temperature. The gels were dried on Whatman 3M and exposed to Kodak x-ray films overnight at −80°C. Films were scanned and analyzed using Scion Image for Windows (Scion, Frederick, MD). Integrated areas under the densitometric curves for each band were used as estimates of DNA binding. For the evaluation of E47 nuclear concentration in splenic B cells, nuclear extracts of equal protein concentration were denaturated by boiling for 2 min in Laemli sample buffer and subjected to SDS-PAGE using a 4–12% polyacrylamide gel under reducing conditions. Proteins were then electrotransferred onto nitrocellulose filters (Bio-Rad, Hercules CA). Nonspecific sites were blocked by incubation of the membranes with PBS-Tween (1× PBS containing 0.05% Tween 20) containing 5% nonfat dry milk (170-6404; Bio-Rad), for 1 h at room temperature (blocking solution). Filters were incubated with: monoclonal anti-E47 Abs (1/400 diluted, 554077; BD PharMingen). These anti-E47 Abs were the best Abs for Western blot analyses, as compared with other anti-E47 Abs tested (data not shown). Monoclonal anti-β-actin Abs (1/8000 diluted, A5441; Sigma-Aldrich) were used as loading controls. Following 1 h incubation with the primary Ab, immunoblots were incubated with HRP-labeled secondary Ab (1/16,000 diluted, 610-1319; Rockland, Gilbertsville, PA) for 3 h at 4°C, developed by enzyme chemiluminescence and exposed to CL-XPosure Film (Pierce, Rockford, IL). Integrated areas under the densitometric curves for each band were used as estimates of E47 expression in the nuclear extract. Total RNA was isolated from 107 unstimulated or anti-CD40/IL-4-stimulated splenic B cells using the TRIzol Reagent (Life Technologies) according to the manufacturer’s protocol. RNA was eluted into 100 μl distilled water and stored at −80°C until use. RT-PCR was performed in a MasterCycler Eppendorf machine. RNA (2 μl) at the concentration of 0.5 μg/μl was used as template for cDNA synthesis in the reverse transcriptase reaction. PCR conditions to detect AID were: 4 min denaturation at 95°C, amplification of cDNA for 36 cycles, each cycle programmed for denaturation at 94°C for 45 s, annealing at 46°C for 1 min and elongation at 72°C for 1.5 min, followed by a final extension phase of 10 min at 72°C. Primers were: AID forward, GGA GAC CGA TAT GGA CAG CCT TCT G; AID reverse, TCA AAA TCC CAA CAT ACG AAA TGC as used by Jabara et al. (32). GAPDH was used as loading control. PCR conditions for GAPDH were 4 min denaturation at 95°C, amplification of cDNA for 30 cycles, each cycle programmed for denaturation at 95°C for 2 min, annealing at 60°C for 2 min and elongation at 72°C for 2 min, followed by a final extension phase of 3 min at 72°C. Primers for PCR amplification of GAPDH were: GAPDH forward, ACC ACA GTC CAT GCC ATC AC; GAPDH reverse, TCC ACC ACC CTG TTG CTG TA. Sizes of the detected PCR products were 606 and 452 bp for AID and GAPDH, respectively. Germline transcripts (μ, γ1, and ε GLT) were evaluated either in unstimulated splenic B cells or after 2–5 days with anti-CD40/IL-4 stimulation. After these times, cells were harvested, RNA extracted and RT-PCR performed. PCR conditions were the following. After an initial 4 min denaturation at 95°C, the cDNA was amplified for 30 (μ and γ1) or 34 (ε) cycles as described before for GAPDH. Primers for μ GLT (245 bp) were: IμF, CTC TGG CCC TGC TTA TTG TTG; CμR, GAA GAC ATT TGG GAA GGA CTG ACT. Primers for γ1 GLTs (429 bp) were: Iγ1F, GGC CCT TCC AGA TCT TTG AG; Cγ1R, GGA TCC AGA GTT CCA GGT CAC T. Primers for ε GLT (392 bp) were: IεF, TGG GAT CAG ACG ATG GAG AAT AG; CεR, CCA GGG TCA TGG AAG CAG TG. Postswitch transcription was investigated by RT-PCR using the following pairs of primers. Primers for γ1 postswitch transcripts (353 bp): IμF, CTC TGG CCC TGC TTA TTG TTG; Cγ1R, GGA TCC AGA GTT CCA GGT CAC T. Primers for ε postswitch transcripts (285 bp): IμF, CTC TGG CCC TGC TTA TTG TTG; CεR, CCA GGG TCA TGG AAG CAG TG. Primers for μ, γ1, and ε GLT, postswitch transcripts and PCR conditions are from Muramatsu et al. (15). The PCR products were separated on 1.5% agarose gels. Gels were photographed using the Bio-Rad Gel-doc system. The two-tailed Student t test was performed on the arithmetic mean of each experimental point. For EMSA and Western blot, arithmetic means were calculated on volume reports (as generated by Scion Image for Windows) from independent experiments, and statistical evaluation was performed using the two-tailed Student t test. IL-4 has been described to induce IgG1 and IgE production by splenic B cells stimulated with B cell mitogens (27). We investigated the ability of anti-CD40/IL-4, to induce CSR in splenic B cells from young and old mice. For this purpose, B cells from young and old mice were left unstimulated or were cultured with anti-CD40/IL-4, for 2–14 days to determine IgG1 and IgE production in culture supernatants. B cells from both young and old mice, stimulated with anti-CD40 alone do not produce IgG1 or IgE (data not shown), as previously described (33). Conversely, when B cells from young mice were stimulated with anti-CD40/IL-4, IgG1 was found in culture supernatants at day 7 and 14, with optimal IgG1 production being attained at day 14 of culture (Fig. 1⇓A). When B cells from old mice were stimulated with anti-CD40/IL-4, IgG1 was found in culture supernatants at days 7 and 14 at significantly (6-fold) lower levels as compared with those in cultures of young B cells. 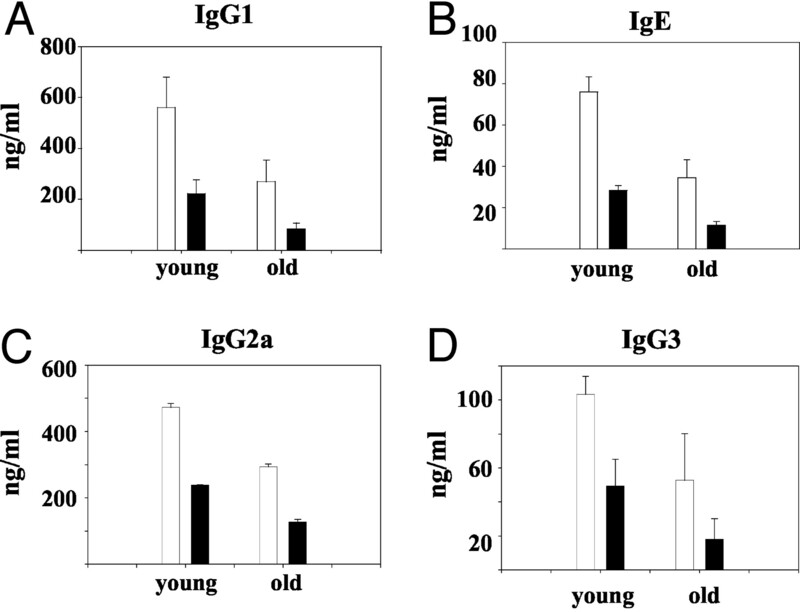 Aging decreases IgE and IgG1 production by activated splenic B cells. Splenic B cells (106 cells/ml) from young (□) and old (▪) mice were cultured with anti-CD40 (2.5 μg/ml) and IL-4 (1 μg/ml), for 2–14 days. IgG1 (A) and IgE (B) levels in culture supernatants were determined by ELISA. Results are means ± SE of nine independent experiments. ns, not significant. C, Splenic B cells (106 cells/ml) from young (□) and old (▪) mice were cultured with anti-CD40 (2.5 μg/ml) and IL-4 (1 μg/ml), for 1–4 days and then analyzed for the expression of membrane IgG1 and IgE using FITC-labeled anti-CD19 Abs and biotin-conjugated rat anti-mouse IgG1 or anti-mouse IgE Abs. Results are representative of nine independent experiments. D, Splenic B cells (106 cells/ml) from young (□) and old (▪) mice were cultured with anti-CD40 (2.5 μg/ml) and IFN-γ (100 ng/ml), or with LPS (10 μg/ml) for 14 days. IgG2a and IgG3 levels in culture supernatants were determined by ELISA. Results are mean ± SE of four independent experiments. Because in mice the CSR response to IL-4 induces first IgG1 and then IgE production (27, 33), we also investigated the release of IgE in the same culture supernatants. IgE production follows kinetics similar to that of IgG1 production. IgE production is also similarly decreased by aging (12-fold less) (Fig. 1⇑B). Flow analyses of membrane IgG1 and IgE-positive splenic B cells from young and old mice cultured with anti-CD40/IL-4 for 1–4 days are shown in Fig. 1⇑C, and show that cell surface expression of IgG1 and IgE is also significantly reduced in old B cells. Flow analyses of B cells switching to IgG1 and IgE isotypes have been performed at days 1–4 of culture because after day 5 the mortality rate in culture is increasing to a significant extent. However, even if cells die, they release IgG1 and IgE Abs that accumulate in the culture supernatants, so that ELISA measurements can be performed at a later time (14 days), which we have found to be the optimum response (Fig. 1⇑, A and B). Our results, showing that the expression of IgG1+ and IgE+ cells in culture precedes the secretion in culture supernatants of these isotypes, suggest that a large majority of splenic B cells expressing membrane IgG1 and IgE are the precursors of both IgG1- and IgE-secreting cells. We also investigated whether CSR to other isotypes is also reduced in splenic B cells from old mice. To test this, B cells from young and old mice were cultured with anti-CD40 and IFN-γ, a stimulus leading to IgG2a production, or with LPS, a stimulus leading to IgG3 production, for 14 days. Both isotypes are reduced in the supernatants of cultured splenic B cells from old as compared with young mice (Fig. 1⇑D), indicating that the age-related impairment in CSR is not restricted to some isotypes, but rather, is a general phenomenon. Anti-CD40/IL-4 induce splenic B cells from young, and to a lesser extent, from old mice to undergo CSR to IgG1 and IgE isotypes. CSR is dependent on E2A transcription factors, as demonstrated by the fact that ectopic expression of Id proteins in primary splenic B lymphocytes completely blocks CSR (34). We next examined the effect of anti-CD40/IL-4 stimulation on E47 DNA-binding in nuclear extracts of splenic B cells from young and old mice. E47 was up-regulated in response to anti-CD4/IL-4 in young (22) and to a significantly lower extent in old mice (Fig. 2⇓A) (35). Moreover, in both young and old mice, the specificity of the binding is for E47, as anti-E47 Abs effectively prevents DNA binding of the complex. 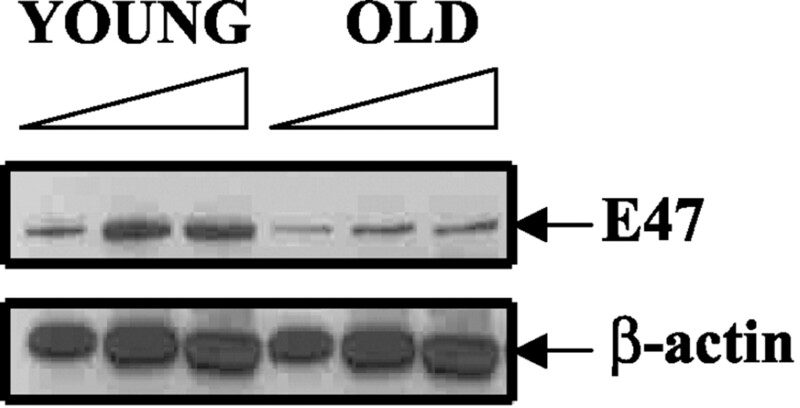 Aging decreases E47 DNA binding in anti-CD40/IL-4-stimulated splenic B cells from old mice. A, Splenic B cells (106 cells/ml) from young and old mice were left unstimulated or were stimulated with anti-CD40 (2.5 μg/ml) and IL-4 (1 μg/ml), for 48 h. Nuclear extracts from the same numbers of cultured B cells were prepared and run in EMSA (10 μg/lane). Films were scanned and analyzed using Scion Image. Integrated areas under the densitometric curves for each band were used as estimates of DNA binding. Vertical columns represent the fold increase ± SE in E47 DNA binding as compared with young, unstimulated controls, taken as 1. Results are the means of the densitometric estimates ± SE from eight pairs of young and old mice. Mean values from young mice (□) were 1 (unstimulated) 20.50 ± 1.27 (anti-CD40/IL-4). Mean values from old mice (▪) were 0.39 ± 0.17 (unstimulated) and 5.91 ± 0.23 (anti-CD40/IL-4). The differences between young and old mice were significant at p < 0.01 for anti-CD40/IL-4 stimulation and not significant when cells were left unstimulated. NS, nonspecific bands; FP, free probe. B, Splenic B cells (106 cells/ml) from young and old mice were stimulated with anti-CD40/IL-4 for 48 h. Nuclear extracts were prepared and run in EMSA (10 μg/lane) using two different probes, μE5 (top panel) and ku 70/80 (bottom panel). EMSA reactions were performed in the presence or absence of the following Abs that are listed at top of each lane: anti-E47 or anti-E12 (which recognize the two spliced variants of E2A), or anti-E2–2, anti-HEB (which recognize other bHLH proteins), or anti-ku 80 (which recognize a DNA-repair protein). Young mice (□) and old mice (▪) were shown. To characterize the complex that binds DNA in splenic B cells stimulated with anti-CD40/IL-4, the nuclear extracts, before the addition of the radiolabeled probe, were preincubated with Abs to either E47, E12, E2-2, HEB, or ku 80 as control. In both young and old mice only anti-E47 Abs effectively prevent DNA binding, confirming that E47 homodimers bind DNA in mature B cells (Fig. 2⇑B, top). Neither anti-E12 Abs (which recognize the alternative spliced variant of E2A), nor anti-E2-2 and anti-HEB Abs (which recognize other bHLH proteins), nor anti-ku 80 Abs (specific for a DNA-repair protein) were able to prevent binding to the μE5 probe. However, when the same nuclear extracts were analyzed by EMSA with a 56-oligonucleotide probe, previously described to bind ku 70/80, no effects of aging or even of B cell stimulation were observed (Fig. 2⇑B, bottom). E47 protein expression is decreased in nuclear extracts of anti-CD40/IL-4-stimulated splenic B cells from old as compared with young mice (Fig. 3⇓). Thus, differences in DNA binding between young and old mice likely reflect differences in E47 protein levels. E47 is down regulated in anti-CD40/IL-4-activated splenic B cells by Western blot analysis. Splenic B cells (106 cells/ml) were stimulated with anti-CD40/IL-4 for 48 h. Nuclear extracts from equal numbers of activated B cells were prepared and run in Western blot. The titration is 4, 8, and 16 μg of nuclear lysate/lane. E47 and β-actin were detected with specific Abs. Results are representative of 10 independent experiments. As E47 was decreased in aged B cells, we further investigated whether AID might also be lower in these cells. Fig. 4⇓ shows that unstimulated cells from both young and old mice express indiscernible levels of AID-specific mRNA. Stimulation of B cells from young mice with anti-CD40/IL-4 induced an increase in mRNA expression at days 3 and 4 whereas optimal mRNA expression was attained at day 5. Stimulation of B cells from old mice with anti-CD40/IL-4 induced AID mRNA expression at days 4 and 5, but the level of expression was lower as compared with that exhibited by B cells from young mice. AID is down-regulated in activated splenic B cells from old mice. Splenic B cells (106 cells/ml) were stimulated with anti-CD40/IL-4 for 2–5 days or left unstimulated. After these times, cells were harvested, RNA extracted and RT-PCR reactions performed. RNA samples were undiluted (top panel) or diluted as indicated (bottom panel). Results are representative of six independent experiments. In four experiments, the levels of mRNA in old mice were ≥67% reduced as compared with those of young mice; in two other experiments, splenic B cells from old mice showed no AID message at all at the optimum day 5. GAPDH was used as a control for RT-PCR. Assurance of comparison of samples in the linear range for PCR was accomplished by simultaneous amplification of three 4-fold serial dilutions of the RT mixes from young and old samples and shown at bottom of the figure. CSR is regulated by accessibility/transcription of the donor (μ) and acceptor (e.g., γ1, μ, ε) target loci, i.e., both GLT, and AID are needed for the actual DNA recombination event. To further pinpoint the defect in CSR in activated splenic B cells from aged mice, we analyzed GLT as well as postswitch transcripts within the Cγ1 and Cε gene regions. Fig. 5⇓A shows that, as expected, if the primary defect was not due to accessibility problems, μ and γ1 GLTs are indistinguishable in young and old mice. Conversely, the postswitch transcripts are lower in aged B cells, indicating less class switch DNA products. Fig. 5⇓B shows that ε GLT are also indistinguishable in young and old mice, whereas the postswitch transcripts are reduced in B cells from old mice. These data are consistent with the defect in aged B cells occurring at the CSR event and not due to problems with accessibility, nor with the cytokine signaling pathway that leads to γ1 and ε accessibility. These data are also consistent with the results of reduced AID in senescent cells. CSR but not GLT is impaired in activated splenic B cells from old mice. Splenic B cells (106 cells/ml) were stimulated for 2–5 days with anti-CD40/IL-4 or left unstimulated. After these times, cells were harvested, RNA extracted and RT-PCR reactions performed. A, GLT for μ and γ1 and postswitch transcripts for γ1. The arrows indicate the forward and reverse primer areas used for Iμ-Cμ and Iγ1-Cγ1 GLT and for Iμ-Cγ1 postswitch transcripts. Linear range for PCR was also established for young and old samples (bottom). B, GLT/postswitch transcripts for ε. The arrows indicate the forward and reverse primer areas used for Iε-Cε GLT and for Iμ-Cε postswitch transcripts. Linear range for PCR was also established for young and old samples (bottom). Results are representative of four (μ) and five (γ1 and ε) independent experiments. To better demonstrate the direct connection between E2A and CSR, we performed experiments with young E2A+/− mice. After stimulation with anti-CD40 and IL-4, B cells from young E2A+/− mice showed reduced CSR to IgG1 (Fig. 6⇓A) and to IgE (Fig. 6⇓B), as compared with wild-type controls. CSR to IgG2a (Fig. 6⇓C) and to IgG3 (Fig. 6⇓D) were also impaired in young E2A+/− mice. Thus, heterozygosity for the E2A gene accounts for reduction in the isotypes released in culture by activated splenic B cells. Both young and old E2A+/− mice have less CSR as compared with wild-type controls. Splenic B cells (106 cells/ml) from young and old wild-type (E2A+/+) (□) or heterozygous (E2A+/−) (▪) mice were stimulated for 14 days with anti-CD40/IL-4 to induce IgG1 (A) and IgE (B), or with anti-CD40/IFN-γ to induce IgG2a (C), or with LPS to induce IgG3 (D). Supernatants were collected and tested in ELISA. Results are means ± SE from three independent experiments. When old E2A+/− mice were compared with wild-type controls, they also had decreased IgG1, IgE, IgG2a, and IgG3 (Fig. 6⇑). The decrease in old wild-type isotype switch as compared with young can also be seen in this strain, C57BL/6 (Fig. 6⇑, compare □ of each figure). It is interesting to note that the amount of isotypes released in cultures of splenic B cells from young E2A+/− mice is comparable to that of old wild-type mice. The difference in isotype production by splenic B cells from young and old C57BL/6 mice in the experiment in Fig. 6⇑ is less than that seen in the experiment in Fig. 1⇑ obtained with B cells from young and old BALB/c mice, and may be explained as a difference between the two mouse strains. In both young E2A+/− and old E2A+/− mice the reduction in CSR as compared with wild type controls was independent of cell proliferation, as demonstrated by comparable [3H]thymidine incorporation in B cell cultures activated with anti-CD40 and IL-4 (data not shown). In C57BL/6 wild-type mice, the age-related differences in B cell proliferation were only 1.6-fold. When AID was measured in splenic B cells from E2A+/− and wild-type young and old mice, it was found to be lower in mice heterozygous for E2A expression, i.e., in the young E2A+/− as compared with young wild-type and in old E2A+/− mice as compared with old wild type, as well as reduced in old wild type as compared with young wild type (Figs. 7⇓). Both young and old E2A+/− mice have less AID as compared with wild-type controls. A, RT-PCR of AID. Splenic B cells (106 cells/ml) were stimulated with anti-CD40/IL-4 for 2–5 days or left unstimulated. After these times, cells were harvested, RNA extracted and RT-PCR reactions performed. RNA samples were undiluted. Results are representative of three independent experiments. These data represent the optimal levels of AID mRNA as day 6 and day 7 (data not shown) gave similar results to day 5. B, Serial dilutions of RT reactions. Comparison of samples in the linear range for PCR was insured by simultaneous amplification of three 4-fold serial dilutions of the RT mixes from young and old samples. Cells were stimulated with anti-CD40/IL-4 for 5 days. Our results clearly show that CSR to multiple secondary isotypes (IgG1, G2a, G3, and E) are substantially reduced in senescent B cells stimulated in vitro. Anti-CD40/IL-4-stimulated B cells from old BALB/c mice proliferate 2-fold less than young controls (data not shown), whereas B cells from old mice produce 6-fold less IgG1 and 12-fold less IgE in culture. Thus, although CSR has been described to be dependent on the number of cell divisions in both humans (36) and mice (37), our results suggest that the observed age-related differences in CSR are not the consequence of defective B cell proliferation, as B cells from old mice can be effectively activated in vitro but their capacity to undergo CSR is impaired. These results are in line with the findings that expression of the receptors for CD40, and IL-4 is unaffected by aging in mice and humans, as already reported (38, 39, 40, 41). We have also found (our unpublished observations) that Stat-6 binding to DNA is comparable in activated splenic B cells from young and old mice. As to the expression of Toll-like receptor 4, which regulates LPS responsiveness, there are no data on B cells, although Toll-like receptor 4 was lower in aged macrophages (42). Humoral immune responses are dramatically impaired in aging mice and humans (11, 12, 14). Humoral responses evaluated by IgG production after influenza vaccination were found significantly decreased in old as compared with young mice; the Abs generated in old mice were also less protective compared with the Abs generated in young mice (11). Similar results have been obtained in humans: Ab (IgG) production to influenza vaccination is significantly and consistently lower in elderly as compared with adults (12). The reduced production of protective Abs in both mice and humans has been attributed not only to intrinsic defects in B cells but also to reduced cell-mediated immunity in senescence, such as unbalanced cytokine production, leading to altered Th1/Th2 commitment of T cells (37, 43), or increased occurrence of expanded populations of regulatory T cells, leading to a restriction of the space still available for functional T cells (43). Our results in this study clearly indicate that intrinsic defects in the B cell may have a crucial role in the generation of an effective humoral immune response in senescence. We have shown that AID is decreased in aged activated B cells as compared with young activated B cells. As AID has been shown to be necessary for CSR as well as SHM (16), both important for an effective humoral immune response, the decrease we see in this study is likely a key regulator of the defective class switch seen in aged mice. The decrease in all switch isotypes tested (i.e., IgG1, E, G2a, and G3) is also consistent with the decrease in AID. Although the promoter-enhancer of the ε GLT contains two E-boxes, the consensus binding sites for E2A, and binding of E2A to the germline ε promoter has been described (44), we didn’t observe differences in GLT between young and old mice. As levels of E47 are decreased in aged mice, theoretically the donor μ sterile transcripts might also have been decreased in aged mice. Our results show that these are also unaffected in aged B cells. Therefore the defect in E2A appears to act downstream of H chain germline transcription both for the donor (μ) and acceptor (γ1 or ε) sequences, but upstream of AID, deletional switch recombination (data not shown) and expression of mature postswitch transcripts. Results in this study show a significant age-related decrease in both E47 DNA-binding activity and protein expression. We have previously shown (23) that the endogenous E47 DNA-binding is low, and importantly, 2× lower than that in unstimulated young spleen cells in the majority (65%) of the mice individually tested. Activation of B cells up-regulates E47 DNA binding in young and to a significantly lower extent in old mice. Therefore, both basal and activated levels of E47 are decreased in splenic B cells in aged mice. These findings suggest that the down-regulation of this transcriptional regulator may help explain not only decreased CSR in activated splenic B cells from old mice, but also age-related changes in affinity maturation and SHM affecting the quality of the Ab response. This hypothesis is also sustained by the recent observation that the E-box motif CAGGTG, able to bind E47, enhances SHM (45). AID, which is regulated by E2A, has indeed been described to be indispensable in three apparently distinct genetic alterations of Ig genes: CSR, SHM, and gene conversion (15, 16) and AID has been recently reported to be down-regulated in old individuals (46). Thus, the age-related impairment in AID expression will also impact not only the quality of the Ab response (affinity) but also the quantity. Results in this study showing that CSR is perturbed in E2A+/− mice further support the important role of this transcription factor in the generation of Abs with different isotypes. Preliminary results on mRNA have shown that E2A mRNA levels are decreased in stimulated splenic B cells from old as compared with young mice (47). RNA stability assays show that the rate of E2A mRNA decay was accelerated in stimulated splenic B cells from old mice. However, E47 protein degradation rates were comparable in young vs aged B cells, suggesting that the regulation of E47 expression in activated splenic B cells occurs at posttranscriptional levels (D. Frasca, E. Van der Put, R. L. Riley, and B. B. Blomberg, manuscript in preparation). Experiments in progress are addressing the AID mRNA expression and stability in stimulated splenic B cells from young and old mice. Although it is known that there are defects in T as well as B cells during aging, our studies indicate an intrinsic B cell defect that may not be able to be rescued by modifying/enhancing T cell activity alone by itself in aged individuals. In conclusion, our data demonstrate that aging down-regulates both basal and stimulated levels of E2A, which in turns causes less AID, leading to less Ig class switch that affects the quality of Ab produced. Definition of the molecular mechanisms leading to reduced class switch in aging will allow us to investigate possible ways of intervention to improve this deficit. We thank M. O’Riordan and R. Grosschedl for providing the E2A+/− mice, and Michelle Perez, Kam Scott, and Jim Phillips for assistance. We also thank H. H. Jabara and R. S. Geha for conditions for AID PCR. ↵1 This work was supported by National Institutes of Health Grants AG-17618 (to B.B.B.) and AG-15474 (to R.L.R.). ↵3 Abbreviations used in this paper: AID, activation-induced cytidine deaminase; CSR, class switch recombination; SHM, somatic hypermutation; bHLH, basic helix-loop-helix; HEB, HeLa E-box binding protein; GTL, germline transcript. Callard, R. E., A. Basten. 1977. Immune function in aged mice. I. T-cell responsiveness using phytohaemagglutinin as a functional probe. Cell. Immunol. 31:13. Kishimoto, S., S. Tomino, H. Mitsuya, H. Fujiwara, H. Tsuda. 1980. Age-related decline in the in vitro and in vivo syntheses of anti-tetanus toxoid antibody in humans. J. Immunol. 125:2347. Klinman, N. R., G. H. Kline. 1997. The B-cell biology of aging. Immunol. Rev. 160:103. Nicoletti, C., X. Yang, J. Cerny. 1993. 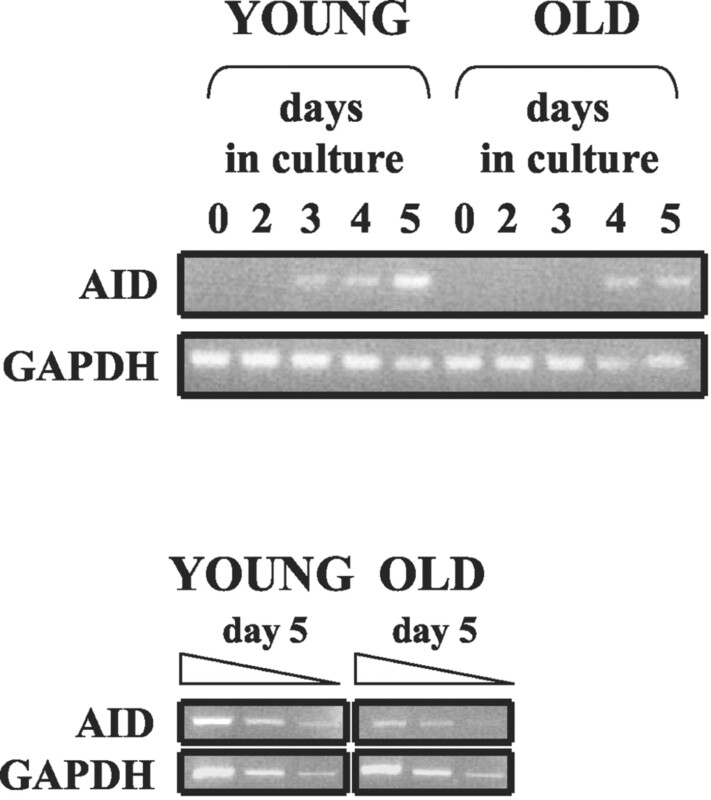 Repertoire diversity of antibody response to bacterial antigens in aged mice. III. Phosphorylcholine antibody from young and aged mice differ in structure and protective activity against infection with Streptococcus pneumoniae. J. Immunol. 150:543. Riley, S. C., B. G. Froscher, P. J. Linton, D. Zharhary, K. Marcu, N. R. Klinman. 1989. 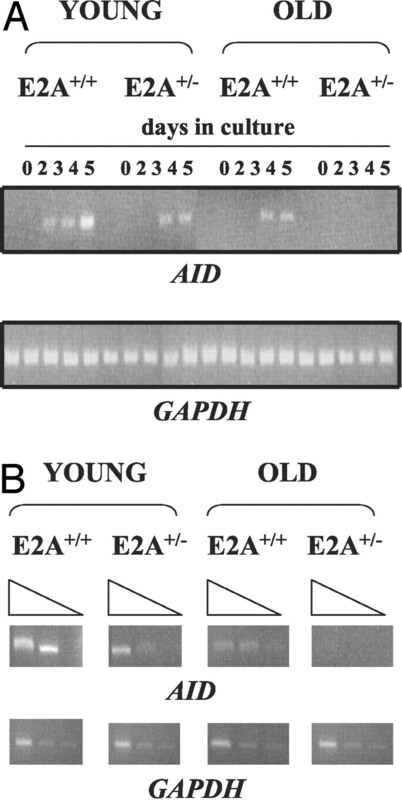 Altered VH gene segment utilization in the response to phosphorylcholine by aged mice. J. Immunol. 143:3798. Nicoletti, C., C. Borghesi-Nicoletti, X. H. Yang, D. H. Schulze, J. Cerny. 1991. Repertoire diversity of antibody response to bacterial antigens in aged mice. II. Phosphorylcholine-antibody in young and aged mice differ in both VH/VL gene repertoire and in specificity. J. Immunol. 147:2750. Hu, A., D. Ehleiter, A. Ben-Yehuda, R. Schwab, C. Russo, P. Szabo, M. E. Weksler. 1993. Effect of age on the expressed B cell repertoire: role of B cell subsets. Int. Immunol. 5:1035. Yang, X., J. Stedra, J. Cerny. 1994. Repertoire diversity of antibody response to bacterial antigens in aged mice. IV. Study of VH and VL gene utilization in splenic antibody foci by in situ hybridization. J. Immunol. 152:2214. Durandy, A.. 2002. Hyper-IgM syndromes: a model for studying the regulation of class switch recombination and somatic hypermutation generation. Biochem. Soc. Trans. 30:815. Imai, K., N. Catalan, A. Plebani, L. Marodi, O. Sanal, S. Kumaki, V. Nagendran, P. Wood, C. Glastre, F. Sarrot-Reynauld, et al 2003. Hyper-IgM syndrome type 4 with a B lymphocyte-intrinsic selective deficiency in Ig class-switch recombination. J. Clin. Invest. 112:136. Asanuma, H., K. Hirokawa, M. Uchiyama, Y. Suzuki, C. Aizawa, T. Kurata, T. Sata, S. Tamura. 2001. Immune responses and protection in different strains of aged mice immunized intranasally with an adjuvant-combined influenza vaccine. Vaccine 19:3981. Murasko, D. M., E. D. Bernstein, E. M. Gardner, P. Gross, G. Munk, S. Dran, E. Abrutyn. 2002. Role of humoral and cell-mediated immunity in protection from influenza disease after immunization of healthy elderly. Exp. Gerontol. 37:427. Han, S., K. Yang, Z. Ozen, W. Peng, E. Marinova, G. Kelsoe, B. Zheng. 2003. Enhanced differentiation of splenic plasma cells but diminished long-lived high-affinity bone marrow plasma cells in aged mice. J. Immunol. 170:1267. Goidl, E. A., J. B. Innes, M. E. Weksler. 1976. Immunological studies of aging. II. Loss of IgG and high avidity plaque-forming cells and increased suppressor cell activity in aging mice. J. Exp. Med. 144:1037. Muramatsu, M., K. Kinoshita, S. Fagarasan, S. Yamada, Y. Shinkai, T. Honjo. 2000. Class switch recombination and hypermutation require activation-induced cytidine deaminase (AID), a potential RNA editing enzyme. Cell 102:553. Honjo, T., K. Kinoshita, M. Muramatsu. 2002. Molecular mechanism of class switch recombination: linkage with somatic hypermutation. Annu. Rev. Immunol. 20:165. Sayegh, C. E., M. W. Quong, Y. Agata, C. Murre. 2003. E-proteins directly regulate expression of activation-induced deaminase in mature B cells. Nat. Immun. 4:586. Quong, M. W., W. J. Romanow, C. Murre. 2002. E protein function in lymphocyte development. Annu. Rev. Immunol. 20:301. Schlissel, M., A. Voronova, D. Baltimore. 1991. Helix-loop-helix transcription factor E47 activates germ-line immunoglobulin heavy-chain gene transcription and rearrangement in a pre-T-cell line. Genes Dev. 5:1367. Massari, M. E., C. Murre. 2000. Helix-loop-helix proteins: regulators of transcription in eucaryotic organisms. Mol. Cell. Biol. 20:429. Kee, B. L., G. Bain, C. Murre. 2002. IL-7Rα and E47: independent pathways required for development of multipotent lymphoid progenitors. EMBO J. 21:103. Frasca, D., D. Nguyen, R. L. Riley, B. B. Blomberg. 2003. Decreased E12 and/or E47 transcription factor activity in the bone marrow as well as in the spleen of aged mice. J. Immunol. 170:719. Rivera, R., C. Murre. 2001. The regulation and function of the Id proteins in lymphocyte development. Oncogene 20:8308. Zhuang, Y., C. G. Kim, S. Bartelmez, P. Cheng, M. Groudine, H. Weintraub. 1992. Helix-loop-helix transcription factors E12 and E47 are not essential for skeletal or cardiac myogenesis, erythropoiesis, chondrogenesis, or neurogenesis. Proc. Natl. Acad. Sci. USA 89:12132. O’Riordan, M., R. Grosschedl. 1999. Coordinate regulation of B cell differentiation by the transcription factors EBF and E2A. Immunity 11:21. Snapper, C. M., F. D. Finkelman, D. Stefany, D. H. Conrad, W. E. Paul. 1988. IL-4 induces co-expression of intrinsic membrane IgG1 and IgE by murine B cells stimulated with lipopolysaccharide. J. Immunol. 141:489. Jacobs, Y., C. Vierra, C. Nelson. 1993. E2A expression, nuclear localization, and in vivo formation of DNA- and non-DNA-binding species during B-cell development. Mol. Cell. Biol. 13:7321. Bain, G., C. B. Cravatt, C. Loomans, J. Alberola-Ila, S. M. Hedrick, C. Murre. 2001. Regulation of the helix-loop-helix proteins, E2A and Id3, by the Ras-ERK MAPK cascade. Nat. Immun. 2:165. Yaneva, M., T. Kowalewski, M. R. Lieber. 1997. Interaction of DNA-dependent protein kinase with DNA and with Ku: biochemical and atomic-force microscopy studies. EMBO J. 16:5098. Frasca, D., P. Barattini, G. Tocchi, L. Guidi, L. Pierelli, G. Doria. 2001. Role of DNA-dependent protein kinase in recognition of radiation-induced DNA damage in human peripheral blood mononuclear cells. Int. Immunol. 13:791. Jabara, H., D. Laouini, E. Tsitsikov E. Mizoguchi, A. Bhan, E. Castigli, F. Dideoglu, V. Pivniouk, S. Brodeur, R. Geha. 2002. The binding site for TRAF2 and TRAF3 but not for TRAF6 is essential for CD40-mediated immunoglobulin class switching. Immunity 17:265. Yoshida, K., M. Matsuoka, S. Usuda, A. Mori, K. Ishizaka, H. Sakano. 1990. Immunoglobulin switch circular DNA in the mouse infected with Nippostrongylus brasiliensis: evidence for successive class switching from μ to ε via γ1. Proc. Natl. Acad. Sci. USA 87:7829. Quong, M. W., D. P. Harris, S. L. Swain, C. Murre. 1999. E2A activity is induced during B-cell activation to promote immunoglobulin class switch recombination. EMBO J. 18:6307. Frasca, D., D. Nguyen, R. L. Riley, B. B. Blomberg. 2003. Effects of aging on proliferation and E47 transcription factor activity induced by different stimuli in murine splenic B cells. Mech. Ageing Dev. 124:361. Tangye, S. G., A. Ferguson, D. T. Avery, C. S. Ma, P. D. Hodgkin. 2002. Isotype switching by human B cells is division-associated and regulated by cytokines. J. Immunol. 169:4298. Sakata-Kaneko, S., Y. Wakatsuki, Y. Matsunaga, T. Usui, T. Kita. 2000. Altered Th1/Th2 commitment in human CD4+ T cells with ageing. Clin. Exp. Immunol. 120:267. Song, H., P. D. Price, J. Cerny. 1997. Age-related changes in antibody repertoire: contribution from T cells. Immunol. Rev. 160:55. Bergler, W., S. Adam, H. J. Gross, K. Hormann, R. Schwartz-Albiez. 1999. Age-dependent altered proportions in subpopulations of tonsillar lymphocytes. Clin. Exp. Immunol. 116:9. Whisler, R. L., J. W. Williams, Jr, Y. G. Newhouse. 1991. Human B cell proliferative responses during aging: reduced RNA synthesis and DNA replication after signal transduction by surface immunoglobulins compared to B cell antigenic determinants CD20 and CD40. Mech. Ageing Dev. 61:209. Zheng, B., S. Han, Y. Takahashi, G. Kelsoe. 1997. Immunosenescence and germinal center reaction. Immunol. Rev. 160:63. Renshaw, M., J. Rockwell, C. Engleman, A. Gewirtz, J. Katz, S. Sambhara. 2002. Cutting edge: impaired Toll-like receptor expression and function in aging. J. Immunol. 169:4697. Saurwein-Teissl, M., T. L. Lung, F. Marx, C. Gschosser, E. Asch, I. Blasko, W. Parson, G. Bock, D. Schonitzer, E. Trannoy, B. Grubeck-Loebenstein. 2002. Lack of antibody production following immunization in old age: association with CD8+CD28− T cell clonal expansions and an imbalance in the production of Th1 and Th2 cytokines. J. Immunol. 168:5893. Sugai, M., H. Gonda, T. Kusunoki, T. Katakai, Y. Yokota, A. Shimizu. 2003. Essential role of Id2 in negative regulation of IgE class switching. Nat. Immun. 4:25. Michael, N., H. M. Shen, S. Longerich, N. Kim, A. Longacre, U. Storb. 2003. The E box motif CAGGTG enhances somatic hypermutation without enhancing transcription. Immunity 19:235. Radu, D. L., T. Kodera, C. Bona. 2003. Expression of activation-induced cytidine deaminase decreases throughout the life. J. Cell Mol. Med. 7:141. Frasca, D., E. Van der Put, R. L. Riley, and B. B. Blomberg. Age-related differences in the E2A-encoded transcription factor E47 in bone marrow-derived B cell precursors and in splenic B cells. Exp. Gerontol. In press.